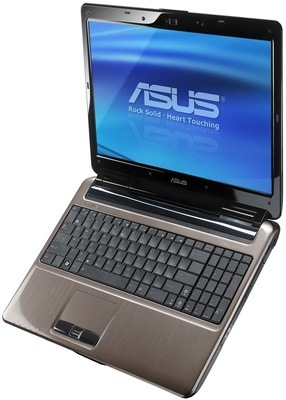 Review If you just want something small and cheap to do a bit of surfing and email on, a netbook is fine. If you need to actually get some proper work done, though, the cut-down spec often isn't really up to the task - which is where something like the Asus N50Vc comes in. Sibling of the smaller N10, the N50 features a decent-size screen and keyboard plus proper grown-up components so it's got enough grunt to do some heavy lifting, but it's still reasonably priced for a laptop and it's not too bad to look at either. The shiny black lid is broken up by a pattern of dotted vertical lines - laid out in a pattern slightly reminiscent of the open sequence to The Matrix - although it is a bit of a fingerprint magnet and greasy paw prints will soon spoil its stylish look. Open it up and you'll find a you'll find acres of space inside - not only has Asus managed to fit in a full Qwerty keyboard but it's also squeezed in a numeric keypad to the right. The keys are a little slimmer on the keypad than the main keyboard, but they're still usable and it's better than not having one at all. There's a good size touchpad below - offset to the left so it's centred on the main keyboard - with large left and right click buttons and a finger print reader nestled in the middle. Above the keyboard, instead of the usual shortcut buttons there's a touch-sensitive strip with LED icons representing various buttons. It takes a while to get used to at first - especially sliding left and right to adjust the volume - but it's easy enough to use with a bit of practice. Filling most of the lid is the 15.4in display, which would make a great screen to work on if it wasn't limited to such a low, 1280 x 800 resolution. This would be fine for a netbook display, or on a 13.3in laptop, but a screen this size could easily support more pixels and still be usable. Like most screens it features a glossy finish, although it's rather more reflective than most.